On June 29, 1951, after his college graduation, Cherry enlisted in the Aviation Cadet Training Program of the U.S. Air Force and was commissioned a second lieutenant. He was awarded his pilot wings at Webb Air Force Base in Texas on October 25, 1952. During a combat mission on October 22, 1965, Cherry’s F-105 Thunderchief fighter-bomber was shot down over North Vietnam. Cherry ejected and landed with a broken ankle and wrist, and a crushed shoulder. He was immediately captured by North Vietnamese militia. After returning home, Cherry discovered that his wife, Shirley Brown, had taken all of his life savings after the Air Force declared him missing in action and started dating another man. Cherry started legal proceedings with the Air Force to have back salary and other payments returned to him. After Vietnam, Cherry attended the National War College and was assigned to the Defense Intelligence Agency. He retired from the Air Force with over 30 years of service on 1 September 1981. In 1982, the United States Court of Claims found the Air Force negligent in handling Cherry’s military pay and awarded him $38,449 in compensation. At the time of the award, Cherry stated that he would contest the decision, saying that he wanted more of the $129,000 that his wife had received from the Air Force. Cherry’s life is the subject of the book, Two Souls Indivisible: The Friendship That Saved Two POWs in Vietnam, by James S. Hirsch, author of Hurricane. Cherry was also featured in the documentary, Tom Hanks Presents: Return With Honor, the story of Vietnam fighter pilots held as prisoners of war. Following his retirement from active duty, President Ronald Reagan commissioned Cherry to serve on the Korean War Veterans Memorial Advisory Board. Cherry also served as the Director of Technical Support Services for E.H. White & Co., and as Marketing Manager for Data Transformation Corp. Most recently, Cherry has served as Chief Executive Officer for Cherry Engineering and Support Services and Director of SilverStar Consulting. Cherry died of cardiac disease on February 16, 2016 at a hospital in Washington, D.C. He is buried with full military honors at Arlington National Cemetery. A new middle school will bear the name of Cherry. Colonel Fred Cherry Middle School, which will seat 800 students when it opens in the Fall of 2018, is the fifth and newest middle school in Suffolk Public Schools; Suffolk, Virginia. Fred V. Cherry, an Air Force fighter pilot, was downed by enemy fire over North Vietnam in 1965, and he spent more than seven years as a prisoner of war.He had grown up in the Jim Crow South, and his captors made it clear that he could mitigate the harshness of his incarceration, including routine torture, and improve his living conditions by speaking out against the racial injustice and discrimination he had faced as an African American in the United States.When beatings failed to bring him around, his jailers tried another tactic. They assigned a self-described “Southern white boy” as his cellmate, hoping that racial antipathy between the two men would weaken his resolve and produce a propaganda triumph for North Vietnam.The plan failed.Instead, the two men, Col. Cherry and a Navy fighter pilot, then-Ensign Porter Halyburton, became fast and lifelong friends. Each would credit the other with having saved his life. Col. Cherry died Feb. 16 at a hospital in Washington. He was 87. The cause was heart ailments, said his companion of 24 years, Deborah Thompson. He was a major and had more than 100 combat missions in Korea and Vietnam behind him on the day — Oct. 22, 1965 — that his F-105 Thunderchief fighter-bomber was hit by enemy antiaircraft fire. Early in his captivity, Col. Cherry was matched with Halyburton, a North Carolinian who had been shot down Oct. 17, 1965. For eight months, they would live together. But whatever mutual animosity their captors may have hoped for never materialized. The two men lived in a succession of fetid 10-by-10-foot cells, sleeping on straw mats, benches or the floor. For 2,671 days, Col. Cherry was held in captivity before his release on Feb. 12, 1973, with the first group of U.S. prisoners of war to come home. Fred Vann Cherry Sr. was born in Suffolk, Va., on March 24, 1928. His parents were farmers. He attended racially segregated public schools and graduated in 1951 from Virginia Union University, a historically black college in Richmond. He then joined the Air Force and, during the Korean War, flew more than 50 combat missions over North Korea. In the summer of 1966, after eight months of sharing a cell, Col. Cherry and Halyburton were separated. Halyburton remembers it as “one of the saddest days of my life.” They did not see each other again until 1973, when they met at a military hospital at Clark Air Base in the Philippines after their release from captivity. Col. Cherry, who later attended the National War College and the Defense Intelligence School in Washington, retired from the Air Force in 1981 as a joint staff officer assigned to the Defense Intelligence Agency. He was a resident of Silver Spring, Md. But Col. Cherry’s homecoming was painful. His wife, the former Shirley Brown, reportedly deserted him soon after he was declared missing, cleaned out his life savings and had a child with another man. The officer endured years of legal proceedings and negotiations with the military over issues involving back salary, child-support payments and allowances. Survivors include his companion, of Silver Spring; four children from his marriage, Deborah Cherry-Jones and Donald Cherry, both of Norfolk, Va., Cynthia Cherry-Leon of Woodbridge, Va., and Fred V. Cherry Jr. of Springdale, Md. ; a son from another relationship, Frederick Stein of Los Angeles; 14 grandchildren; and six great-grandchildren. Col. Cherry and Halyburton, who retired from the Navy at the rank of commander, gave joint talks at military institutions and colleges. 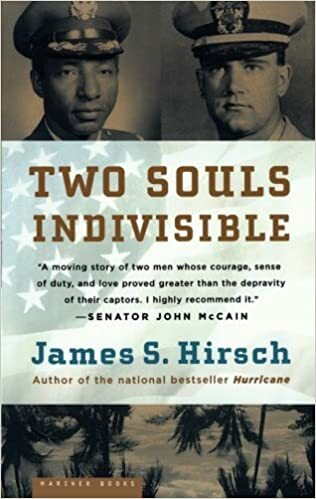 In 2004, they toured to promote a book about their story, “Two Souls Indivisible: The Friendship That Saved Two POWs in Vietnam,” by James S. Hirsch. Col. Cherry also was featured in a public television documentary narrated by Tom Hanks, “Return With Honor,” about Vietnam fighter pilots held as POWs. “I know that the faith in God, love and respect for my fellow man that my parents and family instilled in me during my youth carried me through some very difficult years as prisoner-of-war in Vietnam,” Col. Cherry wrote in the 1999 collection of POW war stories. “My seven and a half years as a prisoner of war (POW) in North Vietnam will always have an impact on my life. I survived the pain, torture, isolation, loneliness, and hopelessness through my faith in God, family, country, fellow prisoners, and self. I relied on my Christian faith to get me through the toughest times. I was thankful for my Christian upbringing and the values which I had been taught by my family, elders, and teachers. When all hope seemed to fade and creep away, my faith would grasp the fading hope and reel it back within my reach. Without the sound values deeply imbedded in me, my performance as an American fighting man in the hands of the enemy would have been miserable and so would my ability to face myself in a mirror today. I am an authentic American citizen of Native American and African heritage. I grew up in a rural area of Virginia, near Suffolk, the youngest of eight children. There were four boys and four girls. We were a very close family. It seemed everyone in the neighborhood was like a family. The neighbors felt responsible to help rear and raise everyone else’s kids. My family was a religious family so we were in the Baptist church every Sunday. All during my youth I was taught what was right and what was wrong, and I was expected to always do what was right. I was very young when I first had a desire to fly. During WWII, my home was near a Navy auxiliary base that was used to practice carrier land-ings on a regular runway. As a young boy, I would often watch these planes and my desire to become a pilot grew. About the same time, the Tuskegee Airmen shipped to Italy and North Africa. The story of these heroes only increased my desire to fly, although my family always thought and maybe hoped I would become a doctor. After high school I went to college and I took all the tests to see if I could join the Air Force and become a pilot. I was accepted, then enlisted in the Air Force, awaited assignment to flight training, completed my training and was commissioned a second lieutenant. In a short period of time I found myself flying combat missions in Korea and flew over 50 combat sorties during the Korean War. After the Korean War, I remained in the Air Force and seven years later I was assigned to Japan for five years. In 1965 I was flying combat missions over North Vietnam. I was flying a F-105 Thunder Chief out of Thailand when I was shot down in October of 1965. When my aircraft was hit by anti-aircraft fire, the cockpit began to fill with smoke. The plane exploded and I ejected at about 400 feet at over 600 miles an hour. In the process of ejection, I broke my left ankle, my left wrist, and crushed my left shoulder. I was captured immediately upon landing by Vietnamese militia and civilians. Thus began my seven and a half years as a prisoner of war. I experienced some very brutal treatment. I spent 702 days in solitary confinement, the longest period of time was for 53 weeks. At one time I was either tortured or in punishment for 93 straight days. During my life I have certainly experienced some memorable times. I believe good conquers evil, and that there is no substitute for honor, integrity, love and faith. I am convinced that faith in God, country, and our fellow man and in one’s self will help to overcome any situation and the toughest of times. I know that the faith in God, love and respect for my fellow man that my parents and family instilled in me during my youth carried me through some very difficult years as a prisoner-of-war in Vietnam. I was always taught to love and respect others and forgive those who mistreat, scorn or persecute me. Righteousness will prevail and evil will be overcome. That same love, honor, integrity, respect, faith and will to forgive have always guided me in every endeavor and walk of life. They have allowed me to overcome the damages of discrimination, Jim Crow, and the social and economic barriers associated with growing up a poor dirt farmer. We have choices to make in life. We need to be concerned that we make the right choices. I strongly advocate that every choice we make be based on some standard. My standard for making decisions is based on doing what is right, or what some might call, doing the right thing. I use as my embedded standard: honor, integrity, faith in God and country and love. Believe that right will prevail over wrong. Know that honor, integrity, faith in God and country, respect and love will set you free.